fishing in the country. When you stay at your favorite Colorado bed and breakfast inn, you can join in the Colorado fly fishing fun! Never fly fished? Want to know more about it? Much like the name implies, the fly fishing method uses an artificial ‘fly’ at the end of a fly-line to lure fish to the surface for a tasty meal. The main difference between fly fishing and ‘regular’ fishing is that instead of a lure or sinker to carry the hook through the air and into the water, fly fishing relies only on the weight of the line. This allows the ‘fly’ to sit on top, or near the top of, the water to mimic natural wildlife actions. Casting is a bit of an art and does require some practice! While many fly-fishers fish for trout, don’t think that fly fishing in Colorado is limited to these fish. Colorado rivers and streams are also home to mountain whitefish, bass, perch, sunfish, walleye, and catfish – all fish that will take a fly if presented properly. Trout varieties in Colorado rivers and streams include cutthroat, brown, rainbow, and brook trout. Fish varieties will depend on if you select warm or cold-water streams and rivers. For the less-experienced fly-fishers, a number of outdoor guides and some of our inns offer fly fishing lessons. It may be easier for beginners to fly-fish in lakes and reservoirs so that the added difficulty of fast-moving water is removed from the equation. The innkeepers of your favorite Colorado inn can direct you to great fishing hole locations, as well as experienced outfitters in their area. Be sure to see our Inn Specials for additional savings. 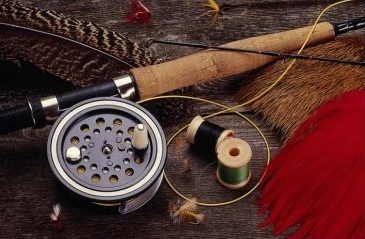 Colorado Fishing Licenses are required for all fly-fishers ages 16 and older. Youth under 16 can fish without a license. If you intend to fish with more than one rod, an “Extra Rod Stamp” is required for each at the cost of $5 per rod. Colorado also has something called a Habitat Stamp which must be purchased with each fishing license at a cost of $10. The monies for this stamp are used to protect wildlife habitats in the state. For Colorado residents, 2012 Fishing License costs are $26 for an annual license, and $9 for a one-day license. For visitors to our state, costs are $56 for an annual license, $9 for a one-day license, and non-residents also have a 5-day Fishing License option for $21. 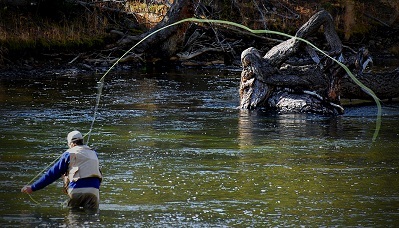 Licenses and stamps are most-easily be purchased from one of hundreds of Licensed Agents – mostly fly fishing shops, sporting good stores, and any store that contains a sporting goods section. If you are caught fishing without the appropriate license, the fine you’ll pay will be MUCH more than the license, so please just buy the license! Social Security numbers are required under Federal Law when purchasing a license, so be sure to have the appropriate documentation with you. A Colorado Fishing Regulations and Property Directory booklet is available when you purchase your license. Make sure to check for any waterways that have special regulations or closures. Aspen area: The Roaring Fork and Fryingpan Rivers are great spots. You can also try the Colorado River. Denver area: The South Platte River is a favorite location. Gunnison area: Try the Gunnison River, both above and below the Blue Mesa Reservoir. Northwest: The Blue River and North Platte River are both great locations. Southern Front Range: Anywhere along the Platte River! South Central & Southwest: The Arkansas River offers miles of excellent fishing. Try the Animas River or the Rio Grande River as well. Summit County and Vail area: Head for the Colorado River, Blue River, or Gore Creek. The Bed and Breakfast Innkeepers of Colorado look forward to hosting your fly-fishing getaway! Don’t forget to visit our Inn Specials for additional savings offered by some of our member inns. This entry was posted in Uncategorized and tagged Fishing, River Activities by admin. Bookmark the permalink. Okay, time to setup the outdoor umbrellas, fishing gear, and wiggly baits because in Colorado, we're going fishing!